Weetwood Bridge has been much altered over its existence but is thought to have first been constructed as a crossing point over the Till during the early 16th Century. 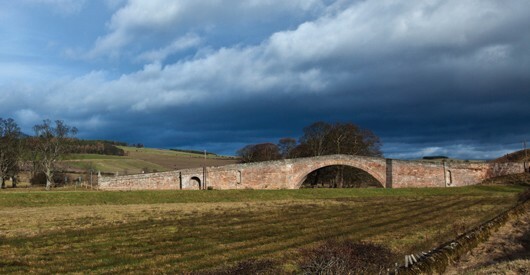 The bridge lies on the direct route from Wooler Haugh where Surrey’s army camped on the 7th September 1513. It would have offered the army the best crossing point over the Till for its heavy ordnance and other equipment as it marched to join the Devil’s Causeway north of the river and onwards to Barmoor Castle on the 8th September. The exact date of construction of Weetwood Bridge is not known. However it is believed to have been built during the early part of the 16th Century and was either in place at the time of the Battle of Flodden or replaced an earlier crossing on the same site. When compared to other medieval bridges, such as that at Twizel, it is clear that this bridge has been heavily modified including changes to its structure and width. A carved stone on the south side of the structure carries the date of 1775 and points to the period when much of the modification to this beautiful and striking bridge occurred. Further works were carried out during the 19th Century and more recently in 2004-2006. The bridge lies on the direct line from Wooler Haugh to join the Devil’s Causeway on the north side of the River Till and would have offered the best crossing point for heavier elements of Surrey’s Army during its march on the 8th of September 1513 from Wooler to Barmoor, as Surrey positioned his force to outflank the Scottish Army on Flodden Hill on the following morning. 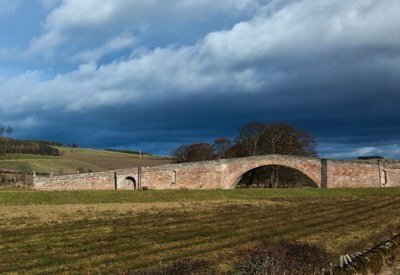 Following the route of St Cuthbert’s Way on foot south and west from the bridge towards Wooler will take you across Wooler Haugh and provide the best opportunities to view these fields from above on the sandstone hills to the east of Wooler. Recently it was noticed that the faces of the bridge were splaying outwards near its crown, under the weight of its own core. Over an 18 month period the bridge had much of its original core removed and new structural ties were placed to hold the two faces together. The core was then replaced with a polystyrene substitute used to reduce the overall weight of the structure and prevent further outward sagging. The bridge is also home to a colony of rare Daubenton’s bats, a nationally protected species. Weetwood Bridge is a Listed Grade I structure. Drive over the bridge from the south and park on the verge beyond. From Wooler - take the B6348 east towards Chatton. Follow the road for 1.75 miles and Weetwood Bridge will appear on your left. Take the minor road over the bridge and park to the north. From the A1 - follow signs to Chatton on the B6348 for 4.5 miles. Pass through Chatton village and continue towards Wooler for 2.4 miles. As you descend into the Till Valley, the road takes a sharp turn to the left and runs down into the valley. The bridge will be visible on your right. Take the minor road north over the bridge and park on its north side. Alternatively follow St Cuthbert’s Way on foot east from Wooler across Wooler Haugh and onto the sandstone ridge. After about 2 miles the route turns north into the Till Valley and crosses Weetwood Bridge.